THIS BOAT IS IN EXCELLENT CONDITION! IT IS A 1997 GRADY WHITE, HOWEVER IT WAS REPOWERED BACK IN 2005 WITH 2 TWIN 225 EVINRUDE E-TEC SALT WATER EDITION ENGINES. ALSO A BRAND NEW 70 GALLON GAS TANK WAS ADDED IN 2005 GIVING IT A 210 GALLON CAPACITY. 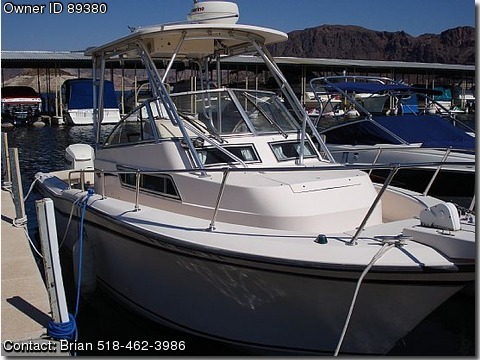 ALSO HAS NEW AUTOPILOT, GPS, FISHFINDER, DEPTH FINDER, ETC(ALSO ADDED IN 2005). COMES WITH A TRIAXLE TRAILER THAT WAS ALSO BRAND NEW IN 2006. ENTIRE BOAT HAS BEEN UPGRADED TO A FISHERMANS DREAM. FISHING GEAR INCLUEDED ARE 2 OUT RIGGERS, 2 DOWN RIGGERS, AND 4 DEEP SEA FISHING POLES. ENGINES HAVE VERY LOW HOURS! !